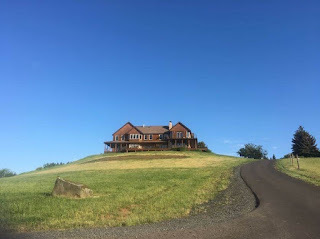 A short 45-minute drive from the Portland airport and we had arrived to a peaceful, pastoral wine country setting in the Willamette Valley. 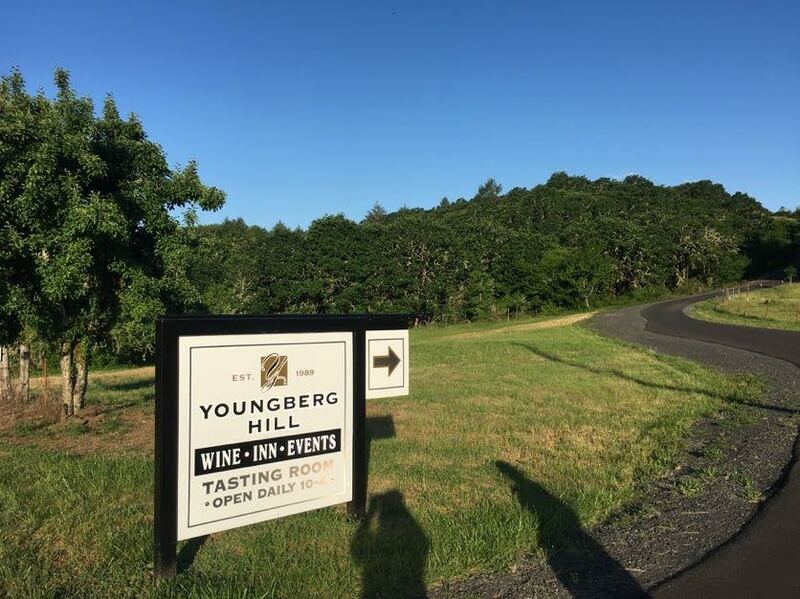 The sign signaled our arrival “Youngberg Hill: Wine-Inn-Events”. A mile-long driveway (more about that later) separated the main road from the tasting room. The views here are beautiful. Views of rolling hills with perfect rows of vines. But what I noticed is that there is a lot of land on this property not planted to vine. 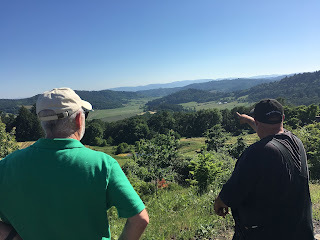 Lots of trees (almost a mini-forest), a small lake among the vines, grazing land for the Angus cattle and Scottish Highlanders, grassy hills, native plants, and did I mention trees? Lots and lots of trees. Why wouldn’t they maximize their 50-acres and plant as much to vine? The answer is biodynamics. Biodynamics refer to the process with which grapes are grown and wine is made. Biodynamics were developed by Rudolf Steiner using his own formulas as well as referring to the astrological and lunar calendars. Organic wine is wine in which the grapes were not sprayed with chemicals (making the grapes certified organic) and the wine was made with no added chemicals (i.e. sulfites). Both biodynamics and organics are very sustainable and have their own pluses and minuses. The beauty of nature, is that there is no waste. Nature is a naturally sustainable system. Biodynamics closes the fertility loop because everything the system needs is within the system. After the mile-long drive up the driveway, you arrive to the tasting room/B&B onsite. It’s a gorgeous house on a hill. When you walk in it feels like it could be your aunt’s living room. A throw rug. Flowers on an end table. Lots of dark wood. It feels comfortable and familiar. To the left you have the tasting room that is very warm and welcoming with sweeping views of the vineyards. As you continue through the house, and it really does feel like a house, you pass through the kitchen, living room area, and a wrap-around deck with views that cannot be adequately described unless you see them with your own eyes. On the deck you are given a taste of the 2017 Aspen Pinot Gris to enjoy, compliments of the winemaker. From here, you can check-in to your room, or begin the full tasting flight. Either way, you are fully immersed in the Youngberg Hill experience. What mortgage payment? What grocery list? What dry cleaning to pick up? All the “noise” of the city and of your daily life seems to melt away and you are fully present on this deck with this taste of wine. According to Wikipedia, experiential marketing is defined as a marketing strategy that directly engages consumers and invites and encourages them to participate in the evolution of a brand or a brand experience. Rather than looking at consumers as passive receivers of messages, engagement marketers believe that consumers should be actively involved in the production and co-creation of marketing programs, developing a relationship with the brand. This blurb isn’t necessarily part of my review of this property. And it isn’t what a consumer is thinking of while onsite, but it’s happening. It’s running quietly in the background. You are experiencing Youngberg Hill in the present. And it’s not in a sales pitchy way, but you are quickly becoming one with your setting. This is your new life for the next day or two. 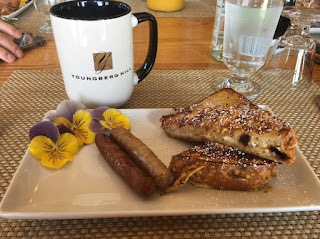 Youngberg Hill has hit the mark with their quiet yet solid version of experiential marketing. There are over 550 wineries to choose from in the Willamette Valley of Oregon, and the wine marketplace in the Valley is fragmented. So much so that 85% of wineries are small, craft producers of less than 5,000 cases. How can the Willamette compete with say, Napa? 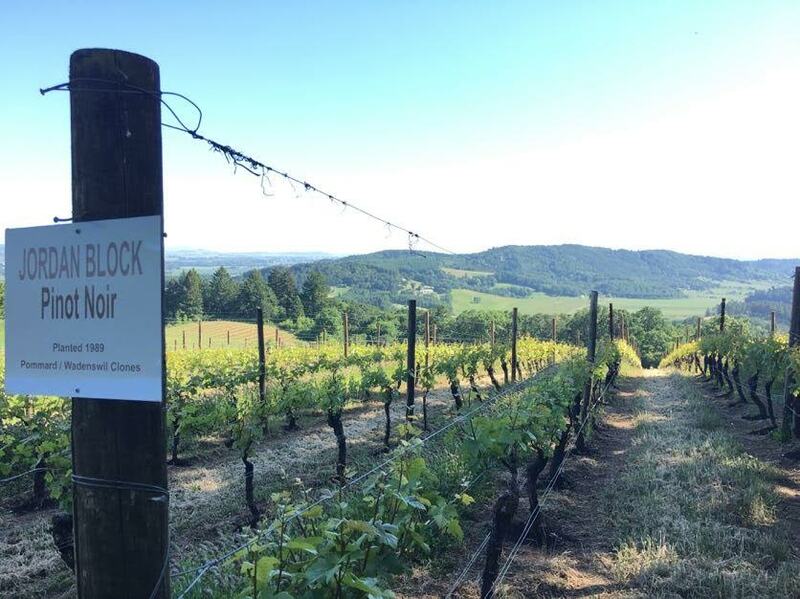 When people are choosing a wine country vacation destination, they have a few options. They can go to a wine country made up of big, fancy McChateaus with names we all recognize, white tablecloth dining, and over-confident tasting room staff. * Or they can come to the Willamette for that quintessential wine country experience: small towns, friendly people, good food, and good juice. Though the Willamette Valley runs a sweeping 150 miles north to south, it feels like one big small town. *I actually love Napa, and have found some gems there. But there is a lot of “fluff” and “noise” to get through in order to reach the authentic part of Napa! Youngberg Hill is a 50-acre estate with 20 acres of biodynamically farmed vineyards. The first vines were planted in 1989, and current owner Wayne Bailey acquired the property in 2003. Today Wayne and his wife Nicolette live on the property with their three daughters: Natasha, Jordan, and Aspen. Wayne is also winemaker at Youngberg Hill and keeps a “pragmatic obsession” and “fervent” “non-interventionist” approach to winemaking. He makes wines that have been described as “seriously organic”. Upon arrival, Neal, Alyse, and I had the Seated Tasting Experience with Karyn Howard Smith, the new Hospitality Manager at Youngberg Hill. Neal and Alyse are bloggers at Winery Wanderings out of Eugene, OR. My tasting notes follow at the end of this post. 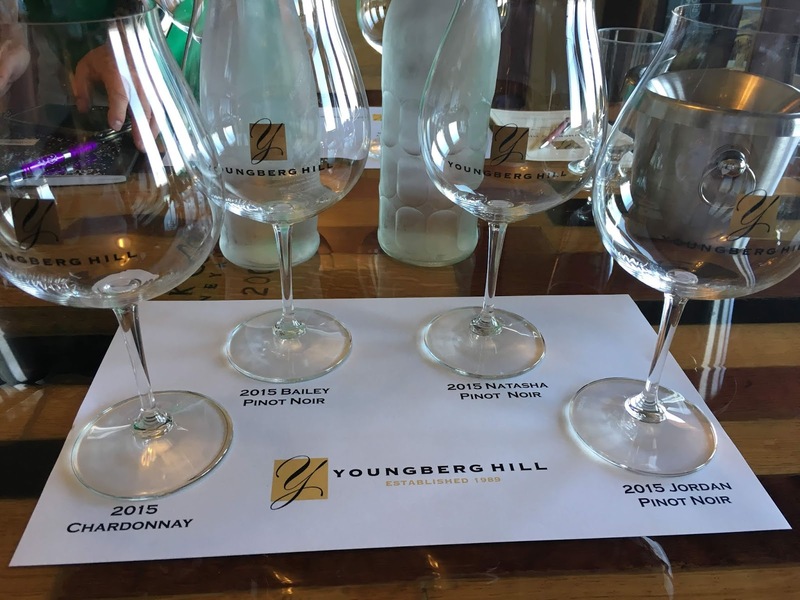 As a visitor to Youngberg Hill, there are two tasting options. The $15 general tasting in the tasting room, or a longer, more in-depth seated tasting experience for $30. After our tasting we were lucky enough to meet Bobby Fanucchi, the self-proclaimed “vineyard guy” onsite. Bobby is everything you’d expect from a guy who works in the vineyard. He walked in sweaty, dirt under his brow, and in overalls. It doesn’t get more authentic than that! Bobby’s passion for the property is evident. He drove us around in a Jeep and you can tell he lives and breathes this place. He knows every nook and cranny and is proud and happy to take such good care of the land. He works in the vineyard 5 days a week and also helps out in the tasting room, when needed. He and his wife also work on the events side in catering for some of their public events. 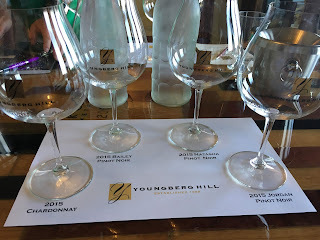 All in all, our visit to Youngberg Hill was impeccable. After our vineyard tour with Bobby we took a glass of wine on the deck in the sunny afternoon. We met a couple visiting from St. Louis, who looked just as relaxed as us! We stayed in the cozy and comfortable Cellar Room downstairs. They even had a bottle of their Jordan Pinot available for purchase (at a discount!!) on the nightstand. Displayed with 2 branded wine glasses. Nice touch. The next morning Alyse and I took a walk to the end of the driveway. I know that doesn’t sound like much, but it was 2 miles roundtrip! A beautiful walk, with a nice incline on the way back. You can even grab a Youngberg Hill reusable water bottle to keep you hydrated! After the walk, I took my coffee (before breakfast) on the deck and met a couple visiting from Washington state. The quiet of this place still astounds me. I live in Los Angeles and have been there for 18 years. It’s never quiet. To be able to sit on the deck and answer emails to the sounds of birds chirping is a beautiful thing. After getting ready for the day we enjoyed a made to order breakfast. 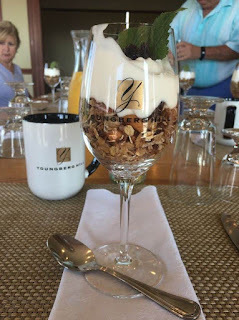 2 courses: homemade granola & Greek yogurt plus sausage links & stuffed French toast. All of this is included with a stay at the B&B. Overall, it was a lovely stay from start to finish. Youngberg Hill has a lot to offer and I’d highly recommend a visit here if you want to “get away” in a peaceful wine country setting in the Willamette Valley. 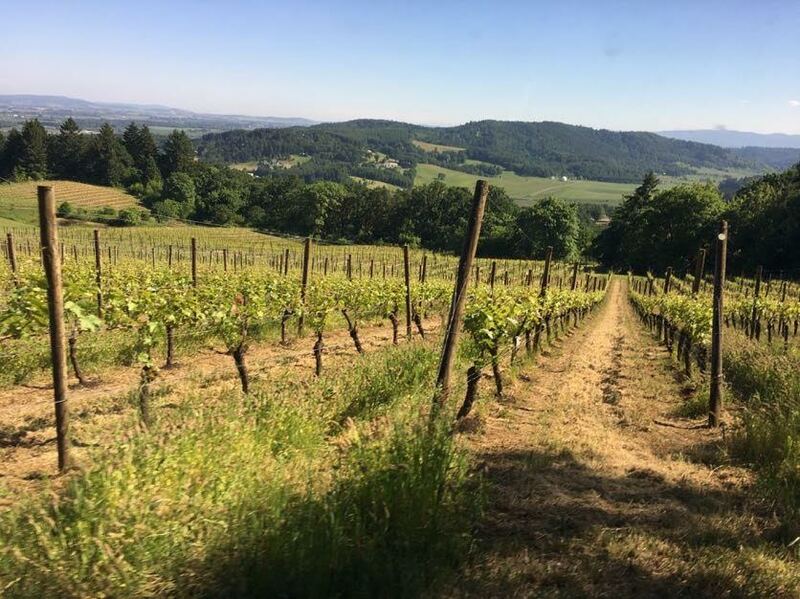 There are over 550 wineries in the Willamette that are waiting for you to experience them and who want to share their stories with you. This is what you get in the Willamette: a convivial atmosphere to enjoy some pretty damn good wine. Warning: Must Love Pinot! 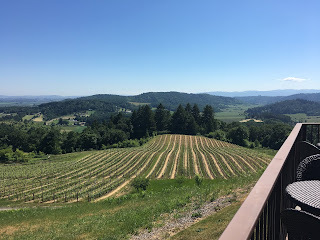 I highly suggest you make Youngberg Hill your homebase while visiting the Willamette Valley. This wine is every so slightly sweet with detectable RS (residual sugar) at 2%. I prefer a drier wine, but this is a nice easy drinker. Some Pinot Gris vines onsite were pulled up to plant Chardonnay. This wine gives me dairy and cream on the nose, with nuttiness on the palate. Barrel aged in once-used oak barrels for 6 months. 336 cases produced. 12.9% ABV. I got slate/graphite on the nose. A nice earthiness/forest floor note and good overall texture/body. The soils for these vines are shale/volcanic. 151 cases produced. 13.3% ABV. These vines are grown on volcanic soil and this fruit gets 1.5 weeks longer hang time than the other Pinots. This wine is feminine and elegant and full of red fruit and floral notes. There is also a strong earthiness, plus spice and tobacco on the back palate. 448 cases produced. 13.7% ABV. The fruit here is sourced from the Rogue Valley, which is south of the Willamette. I get ripe red + black fruit, chocolate, and coffee bean. The fruit here is partially estate-grown and partially sourced. An approachable, easy to drink Pinot Noir with simple notes of red fruit and spice. A great value. This wine is ready to drink now. 286 cases produced. 13.5% ABV.